When Cajun Navy Foundation partners with other nonprofits with similar missions, the possibilities are endless. 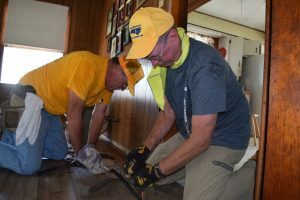 Last week, CNF and the NC Baptists on Mission were able to work together to help a Wilmington family in need. CNF had received a message from a worried mom. Her pregnant daughter’s home was full of mold, and she wasn’t expecting help from her landlord. She was living in the home with her four-year-old son and feared that they might be evicted if she pushed the issue. It was CNF Team Coordinator and Dispatcher Spring Shanewaz’s day off, but she referred the woman to the CrowdRelief.net website to submit a ticket so that it could be handled right away. The dispatcher made some calls to alleviate some of the stress for the family. Shahnewaz knows first-hand how important it can be to take a hands-on approach in situations like this. If you ask her, she’s just an ordinary girl with a little Internet smarts and a whole lot of determination. Shahnewaz said that she ran into a lot of “we can do it later” responses. Finally, someone reached out to the Baptist Men and Women, also known as Baptists on Mission. 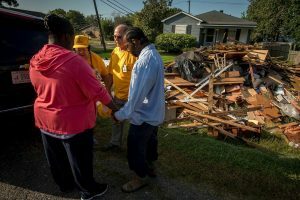 By that night, the young woman and her child were relocated; and the next morning the Baptist Men would be on their way to her home to help. “Those men were angels,” said Shahnewaz. The mother of the pregnant young woman said that she was overwhelmed by the love and kindness they had been given. She wrote Shahnewaz a thank you message.